More than 20restaurants were in competition-from a famous Korean franchise to a traditional restaurant in Ktown with 31 years of history. Restaurants have special offers available for those carrying Bruin cards. Jjampong may be one of Korea’s favorite foods, but this iconic dish has its roots in Japan. It was first created as a dish by Chinese immigrants in Nagasaki, Japan. Traditionally, Jjampong broth was created by using onions and chili oil, to which cooks added a mix of vegetables and pork. This soup was aimed at feeding hungry students on a budget. The staple meal has evolved dramatically since then, to incorporate spicy soup broth, vegetables and fresh noodles, and an abundance of seafood like shrimp, mussels, and squid. Jjampong is almost always served alongside the equally-popular Jjajangmyeon, a noodle dish, in Korean-style Chinese restaurants across Korea and the world. This hot meal is usually enjoyed during colder months as it’s believed to warm up tired bodies. You may also catch busy office workers at lunch time indulging in the ever popular 1⁄2 Jjampong, 1⁄2 Jjajangmyeon combo! If you’re a seafood lover, this is a dish you should not miss! Many Koreans in America, especially those living in LA’s Koreatown, eat Jjampong for their lunch because of its affordable price and unique flavor. To help Korean food lovers find the best Jjampong, the Korea Daily commissioned an online survey comparing 22 Jjampong restaurants in K-town. Almost 1,100 people participated! Selected by 10% of the voters, Cho Man Won (초만원) was the highest-ranked restaurant in the survey. 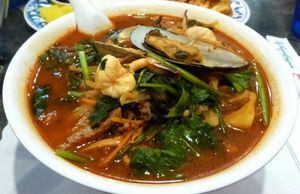 Respondents said they love this restaurant because the seafood is fresh and the Jjampong is spicier than other places. In addition, Cho Man Won is well known for Jjampong being served in a gigantic bowl. Lee Man Goo Gyodong Jjampong (이만구 교동짬뽕) was selected by 7.9% of respondents. A famous franchise in South Korea, Gyodong Jjampong will open its second US restaurant soon in Garden Grove. People love the broth because it has Korean pepper and shrimp in it. In a close third place was Heung Rae Gak (흥래각), chosen by 7.8%. People love this place because they put plenty of seafood and vegetables in their Jjampong and cook it very quickly through their special technique. The Korea Insider was able to visit Lee Man Goo Gyodong and Heung Rae Gak and conduct interviews with the owners of each. Cho Man Won, however, is temporarily closed due to a fire that occurred on August 1. Owner Chulwon Oh hopes to be able to re-open by the end of this year or beginning of 2016. We stopped by Lee Man Gu Gyodong Jjampong for a bite to eat after we heard that it is one of the best places for Jjampong in Ktown. The texture of the noodles was perfect, and the broth was subtle and delicious. The dish was full of fresh ingredients like shrimp and mussels! We also had the chance to sample other items from the menu including Jjajangmyeon and a fried pork dish called Tang-sooyook. The pork was perfectly fried and not greasy at all. It tasted very light, and the accompanying sauce gave it an extra dash of deliciousness. If you have a craving for Jjampong, or want to try it for the first time, check out Lee Man Gu Gyodong Jjampong, which is located inside the food court on the second floor of the City Center on 6th shopping center. If you’re skeptical about getting high quality Jjampong from a food court, then you might miss out on something good! There is also a special treat for UCLA students who visit the restaurant. According to Park, “We are willing to offer UCLA students carrying their student IDs free Jjajangmyun on the side if they order Jjampong and Sweet and Sour Pork.” Sign us up! We visited Heung Rae Gak on a Saturday afternoon to see why this location was chosen as one of the top places for Jjampong. The Jjampong was served along with some side dishes with yellow radish, onions, and kimchi. The soup itself was very hot and had a spicy flavor, and the seafood in the soup tasted very fresh. 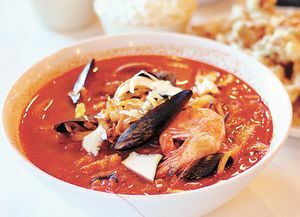 The soup included many kinds of seafood like shrimp, mussels, squid and sea cucumber. Those without giant appetites should share a bowl of Jjampong with a friend because the portions here are huge. Although it’s not a fast food restaurant, staffers prepare food quickly and the restaurant also offers delivery service in Koreatown. If someone is looking for a good place with friendly staff and an at home feeling to eat Jjampong, then Heung Rae Gak is a great choice. “Customers are number one, we try to give you what you want,” said Mike Choi, 27, whose family owns the Korean-Chinese fusion restaurant. Heung Rae Gak was established in Koreatown about 31 years ago and makes an effort to maintain authenticity. Heung Rae Gak also serves a variety of other options such as chicken, seafood, or beef dishes. “For anyone coming here for the first time I recommend the Peking chicken,” said Choi. The restaurant also serves Peking crab, but customers have to call ahead for this particular dish. Choi says he is honest when customers ask questions about the menu. “Unpopular dishes I’d never recommend,” said Choi. “We have a great staff that’s very family-oriented. These chefs try to keep the taste [from ever changing],” said Choi. Although the majority of customers are Korean, Choi told us that he has seen growth in non-Korean customers over the past two years. When asked about their busiest season, Choi said business is well-rounded throughout the year. If it’s hot outside people will usually order Naengmyeon, cold noodles. When the weather is cold, or when someone is drunk or hungover, people will have Jjampong. Even in the summer, Jjampong is very popular. Choi thinks it’s due to the fact that many Korean people want to “fight fire with fire,” meaning that they enjoy hot food during hot weather. With 31 years of service in Koreatown, the family behind Heung Rae Gak is an example of a traditional family sharing their food and culture with America. “I really hope our restaurant will get bigger,” said Choi. Heung Rae Gak offers free beverages to students with UCLA IDs. It is located at 357 Western Avenue, Suite 102, in Los Angeles and its phone number is (213) 383-0178.